Although the ancients knew that they could control certain aspects of their destiny, many also believed in that ineffable essence that could throw a curveball whenever it felt like it—Fate. This slot game allows players to ponder whether or not some lucky spins are in their stars, and it does so in a sublimely sensational fashion. Fate herself is represented as a beautiful, flaxen-haired goddess with a penchant for showing up at the most serendipitous moments. While you're playing this game, you will definitely appreciate her making an appearance on the sixth reel—if she deigns to do so. As a wild symbol and so much more, this gorgeous gal will make you believe in destiny. Back in ancient times, just as today, people would look up and marvel at the stars. The constellation Orion has always been of particular interest, so you will undoubtedly be excited to see this ancient hunter in the flesh. Players who enjoy Novomatic casino games such as Helena, Elven Princess, Crazy Slots and Cupid's Arrow are bound to fall for this original odyssey through the ancient world. With so many stunning symbols, it is difficult to know where to look next. When you're about to tangle with the terrific power of fate, you'll definitely want to know what you're dealing with. In this game, there are many opportunities to seize the moment and see what Lady Fortune may have in store for you. The graphics are gripping, reaching out to you to help you stake a claim on whatever the gods have decreed is yours. Enjoy the epic soundtrack as you boldly go forth, conquering the reels with strength and power. Combining elements of mythology and mysticism, this spectacular slot game has been popular ever since its dynamic debut. Players who enjoy games like Easy Peasy Lemon Squeezy, Dr. Enlarge O and Dragons Mystery have added it to their regular repertoires. It's not difficult to see why; with a unique set-up that calls to mind other brilliant slots such as Diamonds of Fortune, Book of Ra Deluxe and Cops 'n Robbers Millionaires Row, this galvanizing game is sure to electrify your playing experience. Every step of the way, you will be wildly entertained by this sweet slot. If you're curious about a certain mix of symbols—fixed wilds and Orion, for instance—you never need to wonder about what the potential payout would be. With this handy-dandy chart available, you will be able to see exactly how your favourite combinations could work out in your favour. With Fates and Furies, there is never a dull moment. After all, with the impact of destiny affecting every move in this game, it's easy to see why this slot shines from the moment you start playing. When you're playing Fates and Furies, chances are that you may run into a fantastic Fury or two. The blue Ice Fury is known for being especially generous with spins, holding onto some of the best symbols while she makes the reels go around a few more times. Perhaps it should come as no surprise that the fantastical Fire Fury likes to light the reels on fire. After you see the flames, you may even notice some extra wilds appearing on the screen. If you're seeing purple, it's not a hallucination—it just means that the Wind Fury has swept in to save the day by lending her lucky power to a better board. Last but certainly not least is the Earth Fury, who whips up her special abilities to transform playing card symbols into even better cards. With these fabulous Furies on your side, anything can and will happen while playing this game. When you click on the gamble button after winning a round, you will have the opportunity to increase your fortunes even more. All you have to do is guess the colour of the playing card that is turned upside-down. If you are feeling as though the Fates are on your side, you'll click the button and choose either red or black. What happens next may be part of your destiny, so keep an eye on the screen! 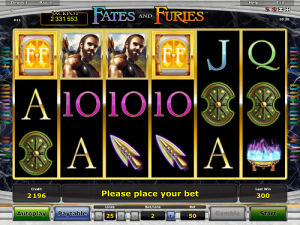 For those who are seeking the whole package when they embark on a new slot game adventure, it's all about Fates and Furies. Not only are the possibilities limitless, but the characters are extremely compelling. If you're going to cast your aspirations out into the world, you may as well choose an excellent game that never fails to get your heart pumping. This engaging form of entertainment draws upon the deepest human folklore and concocts a majestic slot game that always leaves players in awe. When players are seeking ways to be continually astounded, they try their luck with this epic game. After all, it never hurts to appeal to the Fates with your most outlandish wishes; you never know when they might grant them!